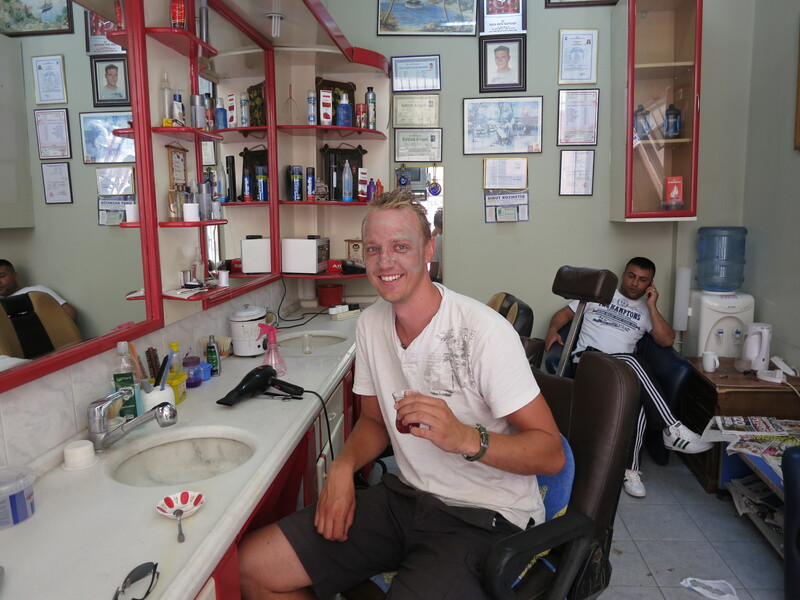 A bloke’s visit to Turkey just wouldn’t be complete without getting another man to have at his face with a straight razor. I like to think it’s testament to improvements both in my travelling skills and general outlook on life that I wasn’t the least bit phased (and in fact was quite pleased, from an entertainment perspective) to discover that neither of the scissor-wielding gentlemen in the establishment spoke a word of English. (For completeness, I should note that I haven’t even managed to remember the Turkish word for “thank you”, such is my foreign language prowess.) But the lack of verbal communication was no problem; a few basic hand gestures later and my excess hair was falling to the floor. Anyway, a hair wash and more scalp massage as he washed the mask off, and then, the pièce de résistance: an alcohol-dipped flaming cotton bud on a metal skewer which he slapped enthusiastically against my cheekbones, presumably to burn off any stray facial hair above the tree line. Total time: roughly 45 minutes. Total cost: 10 Turkish lira, or roughly £3.50 or €4.50. Including the tea. Bargain. The next day I was in Izmir, and feeling that I’d probably squirted out just enough facial hair to make the procedure not a joke, I went for a shave. There’s actually not much to tell about the shaving part of the episode: he did a good job, with two passes for a very close shave, and with no cuts to report (which is more than I can say for my own subsequent attempt to shave quickly a few days later). There’s definitely something strangely luxurious, not to mention faintly ridiculous, about having someone else shave your ugly mug, but I tried not to grin about that too much at the time, lest I lose a much-needed corner of my lip. It hadn’t occurred to me prior, and so I hadn’t planned ahead appropriately, but one also needs to refrain from swallowing at certain key points, in order to maintain the wholeness of one’s Adam’s apple. It turns out that this is surprisingly annoying immediately after downing a complimentary Turkish tea. But you’ll be pleased to know I soldiered through successfully and emerged entirely intact. 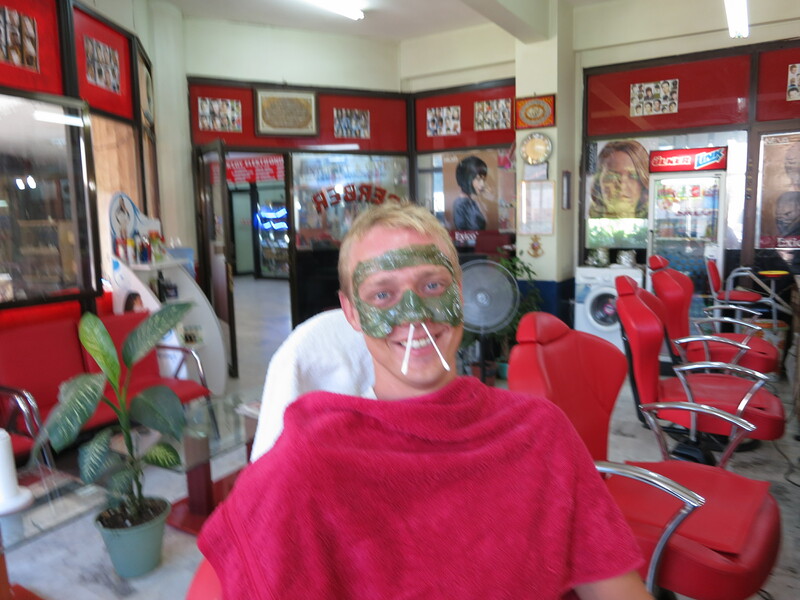 As I reflected contentedly on my now baby-bottom-smooth (but still adult-bottom-unattractive) face, my vendor prepared the next part of the show: hot green wax, which he proceeded to spatula at my forehead and around my eyes until I looked remarkably like I was trying on my next superhero costume. Although that look was slightly ruined by the wax-dipped cotton swabs he shoved unceremoniously up my nose. (Had the previous day’s trimming not been enough? Had my nasal hair magically regrown overnight? Should I be concerned?) Wax time was apparently smoke break time in this establishment, so there was a pause at this juncture as I turned down both a cigarette and a Lipton’s Iced Tea, and waited for both the wax and the barber’s nicotine fix to take hold. Once the wax came off, it was a mud mask and scalp and face massage and we were done. Except for his trying to spray some Lynx up under my tshirt (what was he trying to say?!) – which provided me with an opportunity to discover that the Turkish word for ‘allergic’ is thankfully very similar to the English one. Izmir is a bigger city than Selçuk, and I’m sure I got the big city tourist price at 40 Turkish lira (roughly £14 or €18). But for the entertainment factor, it was worth every kuruş.